Over the past few weeks, I have had a few successful attempts at one-dish meals that tastes pretty decent and that I really enjoyed. The best part about them is that they are pretty easy to prepare. Minimal effort for a yummy home-cooked meal 🙂 A pity I did not take any photos. Thought I would record this for future reference as these are dishes I would want to cook regularly. Sometimes, it’s easy to forget what works and what is nice. Precook rice in the rice cooker. Add oil to the pan. Fry the garlic and onions until fragrant. Add the rice and the other ingredients. Fry and mix everything together. Add light soy sauce and sesame oil and continue to stir and fry for a while. I got this recipe from Campbell soup website. And it tasted awesome for home-cooked cream based pasta. I have tried some other brands for cream based pasta sauce and so far have not found one that I like. But thumbs up for Prego Cabonara Mushroom sauce! To prepare the stock, rinse the ikan bilis, chop the onion into a few pieces and remove the garlic skin. In a pot, fry them till fragrant. Then add 1.2 litres of water and simmer for 90 minutes. Add the swanson clear broth. Drain and remove the garlic, ikan bilis and onion. Stock is ready for use. Marinate the mince meat using some light soy sauce and sesame oil. Add the noodles to the boiling stock. Add the rest of the ingredients (I added the mince meat first followed by the rest of the cooked ingredients). Scoop into individual bowls and add shallots for garnishing. 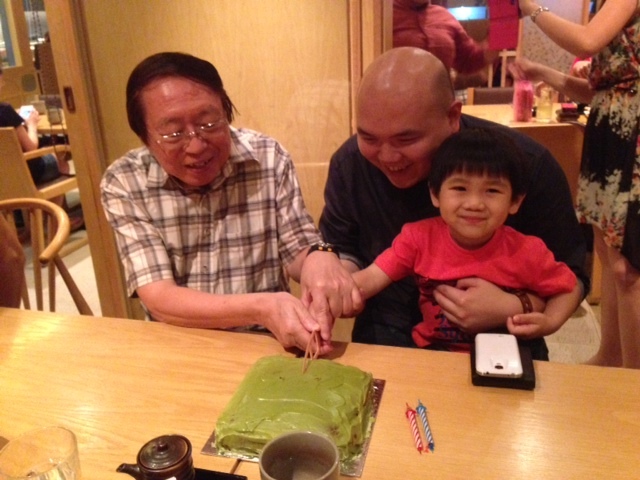 Papa’s birthday cake – Matcha cake improved! 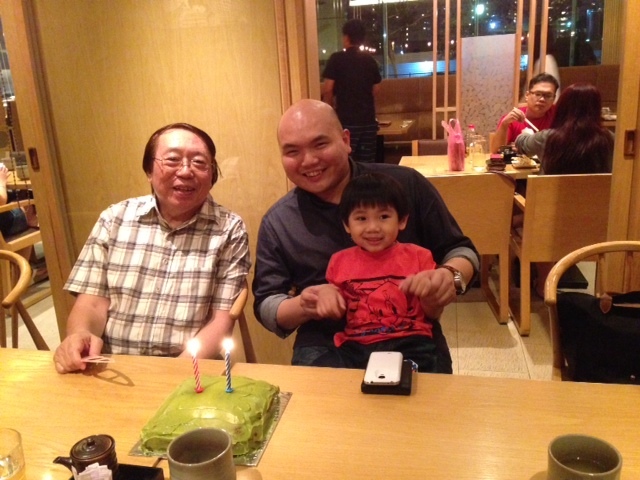 For my dad’s birthday, I decided to give this matcha recipe from allrecipes one more try. I decided to do the matcha cake again for the following reasons. I wasn’t totally satisfied with the one I did for Nami’s birthday. I felt that the green tea flavour was not strong enough and it was much too sweet for my liking. So this time, I drastically reduced the sugar and increased the amount of green tea powder. The result: Yumz!! 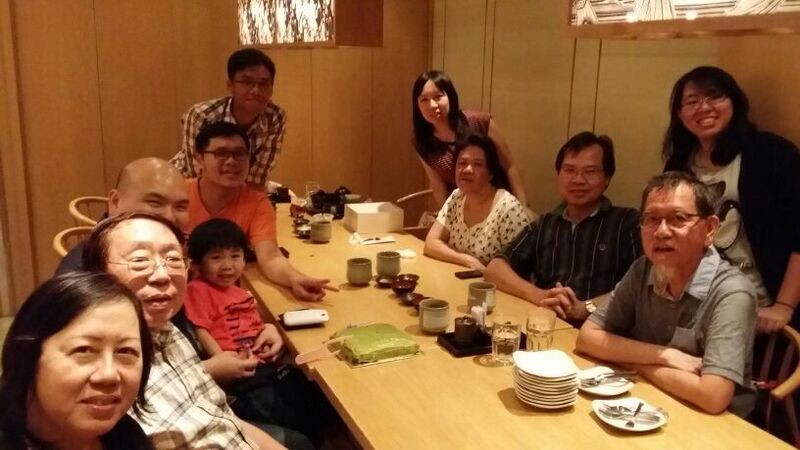 I enjoyed the cake a lot, which I was surprised, cos I seldom enjoy cake so much. I have more of a savoury rather than sweet tooth. I also like eating it as a loaf cake without any icing. Here is the revised recipe which is certainly a keeper and one which I will use again! The method remains the same. For the icing, I also adjusted the amounts slightly as I did not need so much since I would not be doing a layered cake. I also wanted it less sweet with a stronger green tea flavour. Daniel always joins the cake cutting and candle blowing even when it is not his birthday! 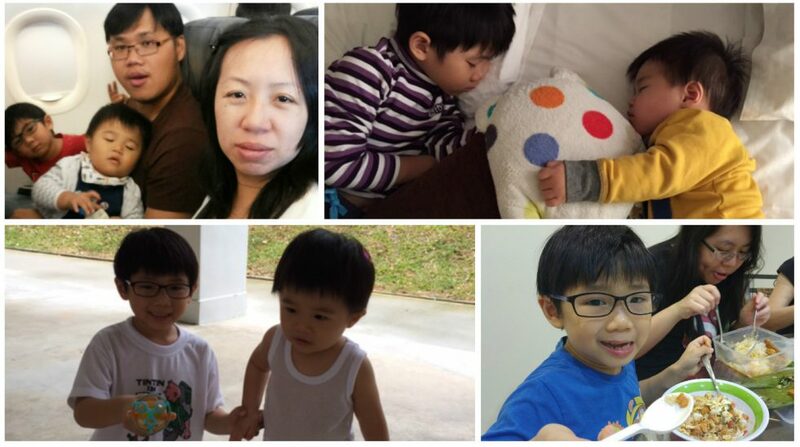 Zixuan (Pris’ bf) also shares the same birthday as my dad!